I was not able to try anything NEW this past week, so I decided to post one of my old favorites! I grew up eating this meal because for my mom, it was a quick and easy one to throw together and we all loved it. 2. Mix chicken with softened cream cheese. 3. 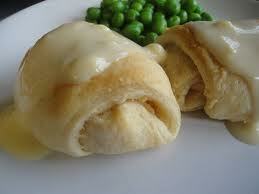 Place a spoonful of cream cheese chicken mixture on a single crescent roll triangle and then roll up. Pinch edges so the mixture does not ooze out during baking. Repeat with the remaining crescent roll triangles. 4. Bake according to the crescent rolls' package directions. 6. Once the chicken pillows are ready, serve warm with a spoonful of the soup as a gravy. I like to serve this dish with rice pilaf and a vegetable of choice. So simple and yummy! Anytime I serve this meal to guests, they absolutely love it! At the moment, I am unsure of how to make this gluten free, unless you make your own bread dough (so it won't be the same croissant flavor, but more like a roll instead).